We offer a wide selection of Indian, Bangladeshi and English Cuisine and a good selection of fine wines. We aim to bring you large varieties of eastern & western delights. Authentic, traditional and contemporary dishes served in a comfortable and relaxing surroundings, very extensive menu provides the very best Indian Bangladeshi, English cuisine from many regions of famous subcontinent. 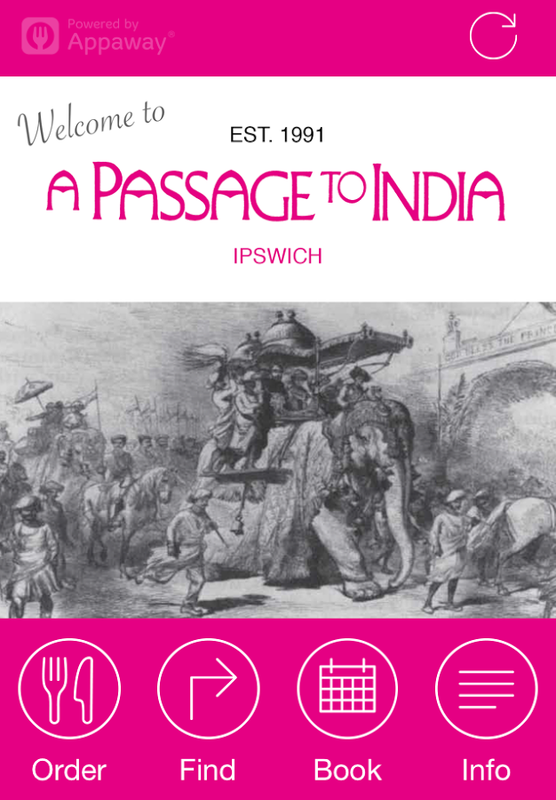 A Passage to India is fully Licensed serving a wide selection of wines and beers form east to west around the world. We cater for vegetarians and non-vegetarians, no animal fat is used in our cooking, all chicken dishes used are 100% prime breast. Please note in our cooking some dishes contain Almonds, Sultanas and powdered coconut. If you are allergic to these or any other ingredients, please inform us when you place your order. Our Fresh hand picked vegetables and spices are hygienically cleaned in order to produce the best curries in terms of taste and quailty. We hope you enjoy your meal, if there is a dish you would like that is not on the menu, please ask our waiters/waiteress, they will do there best to meet your requirements. Our aim is to provide the highest standards of quailty, service and above all hygiene, therefore your patience would be appreciated while our chefs cook your meal. ''Allergy Watch'' Some of our dishes may contain nuts or other allergic ingredients, if you are allergic to anything please make sure you check with the person taking your order and inform them of any allergies you have. We cater for vegetarians and non-vegetarians. No animal fat is used in our cooking, all chicken dishes use 100% prime breast. Most of the chicken dishes served off the bone, with white breast meat. All prices are inclusive of VAT.